That was one of the takeaways from the Image Sensor Auto conference that I reported on last month. There is no doubt cars will simply become robots that take us places, but what will happen between now and then? But the car manufacturers live in a different reality. Together they produce about 100 million cars annually. They can’t afford shooting for the moon, but instead have to focus on next year’s model. They need to adopt technology that is available at reasonable cost and in volume today. Technology that really works and can go into production. In addition, their cars need to comply with international safety standards and laws. For the OEMs, going from today’s manually operated car to tomorrow’s fully autonomous car is not a step change, but a gradual one. Systems that help the driver, instead of fully take over, are typically called ADAS, for Advanced Driver Assistance Systems. In order to bring some order to the wide variety of driver assistance systems on the market and in development today, the International Organization of Motor Vehicle Manufacturers (OICA), working closely with the United Nations, defined a classification of driver assistance systems. 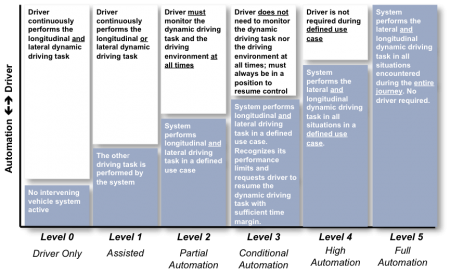 They provide a framework with 6 levels of assisted driving, highlighted in the table below. The levels are primarily distinguished by who has control over the steering wheel and pedals and when. At Level 0 the vehicle is operated by the driver, while at level 5 the car is completely operated by electronics. At Level 0 the driver is fully in control of the vehicle at all times. The vast majority of the vehicles on the road today fall in this category. A car operates at Level 1 when the electronic system controls either the steering wheel or the speed of the vehicle, but not both. The driver is still actively involved with operating the vehicle. At Level 2, the driver must pay attention to the road, and monitor the vehicle’s speed. In case the electronic systems don’t respond adequately, the driver must quickly take control of the steering wheel or apply the brake. Lane keeping assist combined with adaptive cruise control is an example of such a system. Level 0, 1, and 2 may all include systems that aid the driver, but don’t take control over the gas and brake pedals or the steering wheel. Many ADAS solutions on the market operate this way. Rear view and surround view cameras give increased visibility to the driver for instance. Level 3 describes a vehicle that takes over the task of driving, but needs to recognize its limits and hand back control to the driver with sufficient notice in case it can’t safely operate the vehicle anymore. Volvo presented such a scenario where the driver can focus on something else without having to pay attention to traffic. A Level 4 the car is fully autonomous but only during a defined use case, for instance on specific highways, only below certain speeds, or during good weather conditions. Only at level 5 does the car always operate itself, and can reach any destination safely with or without a passenger on board at any time. It will be some time before Level 5 vehicles are on the road, but level 2 vehicles are already in production. At videantis we address all these levels of assisted driving. Our scalable vision processor technology applies to rear view or surround view cameras, and making them smarter, as well as to high-end front camera systems that take control over the steering wheel, the brake, and gas pedals.